You have your choice of distances 300m Splash 9km Spin 2km Stroll or 600m Splash 18km Spin 4km Stroll. On the day participants will start in waves with 10 ladies going off at a time. Roads will be closed for a safe event. Flippers or floaties can be used to get you through the swim if needed – teams are welcome but no sneaking the blokes in! Any bike is good to go for a spin on and if you only want to walk instead of run that is up to you. As part of your registration, our amazing event supporters will be hosting free clinics to help you improve your knowledge and skills in the lead up to the event. Register early to secure a spot in one or all of these clinics. Giant Rockhampton will be hosting a bike maintenance clinic Wednesday 27th March at 6.00pm at Giant Rockhampton. 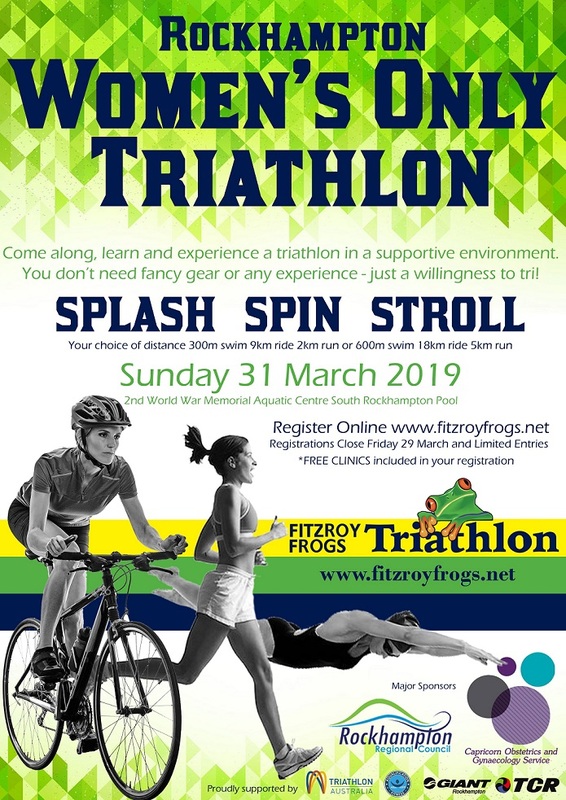 Check out our website for more details on Triathlon‘s and heaps of information to help get you started if you’re not sure. *Stay posted for detailed maps of the courses.